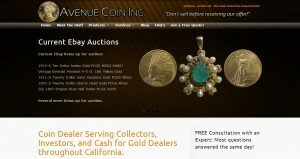 Avenue Coin Inc address, phone, website, hours of operation, and more. Avenue Coin Inc. (ACI), located in Stockton, California, is a leading rare coin dealer, precious metals broker and cash for gold service. We also buy diamonds and estate jewelry, scrap gold and dental gold, Rolex watches and pocket watches, and sterling flatware. As a rule, we’ll be interested in anything with a gold, silver, platinum or palladium content. We also buy and sell paper money, foreign coins, and ancient coins. ACI also provides foreign exchange service and offers appraisals of rare coin and paper money collections at reasonable rates. Our staff has over 160 years of combined numismatic experience. Besides serving the public in the Stockton and Modesto areas, ACI also provides wholesale support for more than 70 other businesses including pawn shops, cash for gold dealers, other coin dealers, jewelry stores and gold prospectors. The majority of our new customers are through referrals from satisfied clients. ACI’s future depends on the success of our customers. ACI began as a one-man operation in 1995 and has grown steadily every year because we are focused on our customer’s needs. At ACI we understand that our customers shop around for the best deal and that premiums and product availability often change in this volatile market. To maintain our competitive edge, we are constantly checking and adjusting so that our buy/sell prices are the best that can be found anywhere. Our customer loyalty is earned by providing consistent and dependable prices as well as being a valuable resource for the latest news and market information.